Rich Rodriguez plans to issue a statement later this afternoon. David Brandon thanked Rich Rodriguez for his service and said the poor performance of the football team was not because of Rodriguez's lack of effort. Brandon said he and Rodriguez went through a thorough evaluation yesterday. Brandon said he made his decision about Rodriguez's future last night. Brandon says he intends to lead a national search for a new coach and has "a lot of work to do" to find that new coach. Brandon says Stanford Coach Jim Harbaugh has a lot of contacts at the University of Michigan, and from what Brandon understands Harbaugh is looking to the NFL. 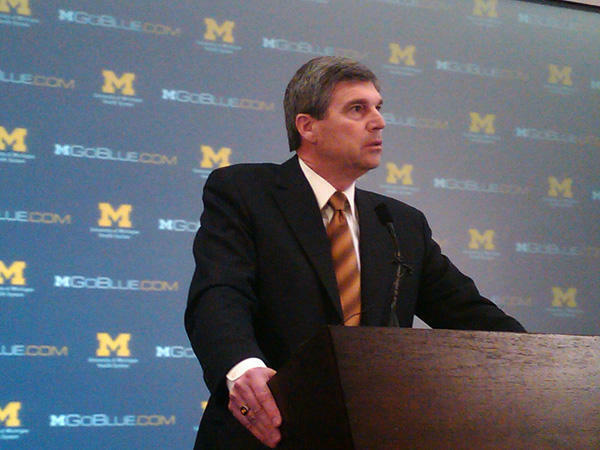 You can view the live press conference on MGoBlue.com. Look for Michigan Radio's Steve Carmody (front row left). 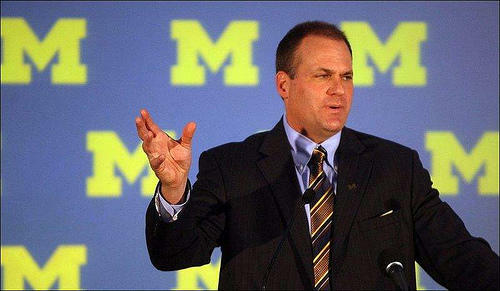 The University of Michigan's head football coach Rich Rodriguez has been released, according to John U. Bacon. Rodriguez and Athletic Director David Brandon met this morning to continue their talks that started yesterday afternoon. Michigan Radio's Steve Carmody will cover the press event scheduled for 12:30 this afternoon at the Junge Family Champions Center on the campus of the University of Michigan. The press conference will be streamed live at MGoBlue.com. The drawn out process of these negotiations has been a topic in the national press. Initial reports that Rodriguez was fired came yesterday from Detroit's Fox 2 News and the Detroit Free Press. But the reports could not be confirmed. The University of Michigan later issued a statement saying those reports were speculation.